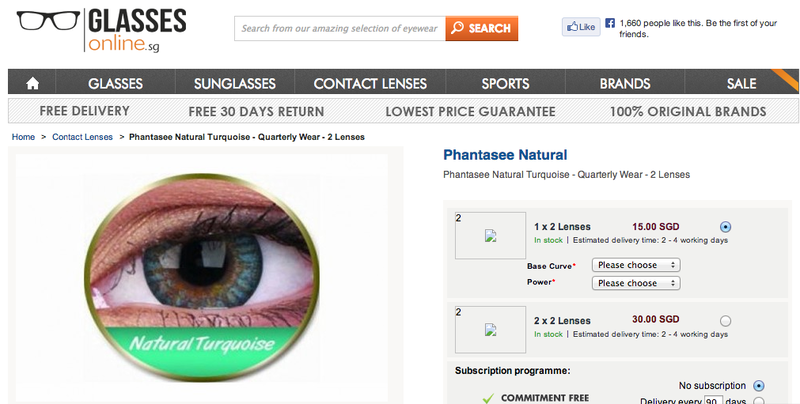 GlassesOnline : Purchase Affordable Coloured Lenses Right Here! When the first coloured contact lenses emerged like a decade back ago, I was thrilled to bits because looking like an ‘ang moh’ was the hype back then. So besides getting my hair coloured dyed to a lighter shade of brown, I would put on my latest grey coloured contacts so that I could achieve this ‘mixed blood’ look which was considered to be really favourable among us Asians. If you are born with a natural shade of hair colour with brown or blue eyes, you will be labeled as this ‘mixed-blood’ beauty with people looking at you with envy. And to be that centre of envy, I never knew that I would be bold enough to break the school rules and wore coloured contact lenses to school. That’s quite a big sacrifice for me as a model pupil in secondary school where all the teachers knew I was a two goody-shoes pupil who suddenly turn into a devilish pupil overnight with grey menacing eyes. After receiving some lashings and having my reputation being tarnished overnight, I couldn’t really bring myself to wear coloured contacts again. And over the years, I’ve seen countless girls who wore coloured contacts and circle lenses which looked rather unnatural and awkward on them. I couldn’t help but to develop this stigma against wearing coloured contacts – that made you seem like you are trying really hard to be someone else. But this year, I’ve taken a different outlook of coloured contacts. Today, I see it as a fashion statement. It’s a fashionable accessory that enhances the size and shape of your eyes and add character to your overall outfit. So, this is the very reason why I’m back to wearing coloured contacts. But shopping for contacts lens was now made easier with the wide variety and brands of coloured contacts made available online. Having discovered that online shops carries more brands of lenses, I now prefer to make my purchases of coloured contacts online rather than visiting local optical stores to get prescription lenses. It is a great disappointment to know that the optical and eyewear shops here in Singapore only offer Freshkon, FreshLook, Maxi Eyes and Acuvue contact lenses with limited range of colours. They not only offer a limited selection of choices for consumers, they also sell these lenses at a much higher price. That’s the reason why coloured contact lens – wearer turn to the online shopping world to make purchase of these so-called ‘accessories for the eyes’. But with the rise in counterfeits, especially for coloured contacts, it’s always important to make purchases of lenses from reputable online websites like Glasses Online. As a pioneer online glasses store in Malaysia, GlassesOnline is one safe and reliable website which offers a wide assortment of prescription glasses, frames, contact lenses and sunglasses at remarkably low prices. Take for instance, the GEO coloured lenses are sold around SGD 20 plus at other online stores but at GlassesOnline, GEO lenses price are marked around SGD 11 only. That’s like 50% cheaper! This is a great deal not to be missed, for sure! With all that assurance that this online glasses store provides a safe,secure and fuss-free shopping experience, I too made an order online. This time, I’m choosing a bold coloured contacts over conventional black/brown lenses. Given a choice, I would have chose dailies instead of monthly contact lenses as my eyes gets dry very easily. But monthly contact lenses works out fine too as long as you don’t wear them for long hours. I’ve yet to try Phantasee Natural contact lenses. It’s a quarterly contact lenses which you can wear up to about 3 months (a quarter of a year). Due to it’s long wearable period, it has rather high moisture content (45% water content). However, it is not advisable to wear disposable soft contact lenses for such a long period of time. So, I’m just going to put on these lenses for a month or so before change to a new pair of lenses. Do note that some brands of coloured contacts does not have power. I made a mistake in ordering a pair of Phantasee lenses which does not have power!That would mean that I would have to wear my glasses on with those lenses.What a bummer! Anyhow, I can’t wait for the lenses to arrive! And if all works well, I might get another fancy pair of coloured contacts, just to brighten up my day and beautify my eyes. Planning to make your first purchase at GlassesOnline? To all my faithful followers and readers, key in this promotional code ‘GOBLOG10’ for a SGD10 off on any order over SGD50. That’s an added deal just for you! Halloween is just around the corner! Bring up the horrifying factor of your looks up a notch with animation contact lenses! Do visit the following links for more information!